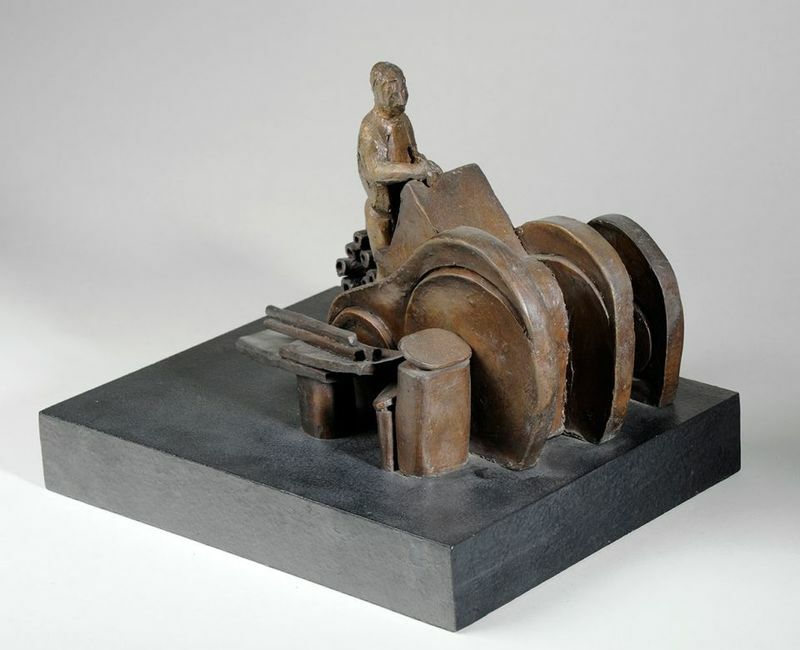 Like a Chinese puzzle, Koenig's Lilliputian factory workers in clay and bronze nestle into, and intersect with, their machines and workshops. Even at rest as in Tea Break (1972), they retain their working postures. This fact was poignant to the artist as her meticulous sketches of workers' poses in all circumstances attest. The miniature scale of the pieces is reminiscent of the ancient Egyptian and Chinese tomb models of regular people baking, brewing, and harvesting, often a more effective subject and size than fear-inspiring, monumental portraits of kings. Koenig chose to focus on the modest and noble proletarians of postwar southeast England, who mass-produced tents, glass containers, and calendars. Despite the banality and ephemerality of the products they manufacture, these complacent but determined workers, like their sepulchral predecessors, capture an eternal aspect of our humanity: the gift and curse of work.